These homes were built in 1889 and opened on the 4th November 1890 in Wednesfield. They remained in use as children's homes until 1977. Originally built in what was then open countryside, the cottage homes site included a school and an infirmary. According to http://www.localhistory.scit.wlv.ac.uk, the site covered an area of about 20 acres and the buildings cost £20,000 to build. Initally the site accommodated up to 240 children having eight cottages which could each house 30 children. The cottages were all in a line one side of an avenue running parallel with Amos Lane. The school within the cottage homes closed in 1932 after which point the children presumably went out to local schools for their education. It seems that the buildings were demolished in the 1970s or soon afterwards. (Photograph from Geograph.co.uk by John M). 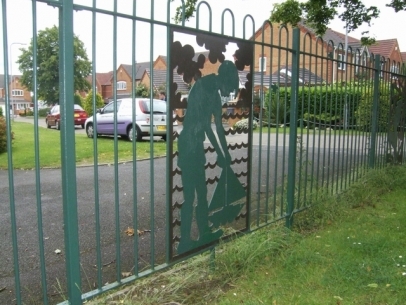 A housing estate now stands where the cottage homes once stood, a reminder of the children who lived there remains in the decorative railings. "I was in the Wednesfield Home in 1950 until 1954 when I was taken out for the Christmas Holiday. Although just 2 years old when I went in my memories are still very vivid. "I will try to tell you as much as I can but you must remember it was 60 years ago but I will do my best to give you some in-sight as to what it was like. "You asked how many buildings there was, for me there was only one though there must have been more to house all of the kids that were in there. But we were only allowed in our own place. In all the time I was there I only recall going outside once and that was when I was taken out for Christmas by the family who eventually adopted me. The nearest I got to go out was once a week on a Friday when I was allowed to sit with the only friend I had and look out of the window. I can recall he would sit and cry as the other kids went past on their way home, the outsiders we called them. Exactly how many kids were in the home it was difficult to know. "Meal times you had to grab what you could or you would go hungry - the bigger you were the more you got. I recall my first meal that Christmas out of the home, the family I was placed with sat open-mouthed at the way I grabbed everything and rammed it into my mouth but I knew nothing else. "Inside the building was very cold and drab but the main area in the entrance hall was quite grand but this was the part the outside world got to see - nothing like where we were kept out of sight, I only went in there twice once when I was taken out and then when I returned. The dorms were quite big to a small boy I think there was about six beds in each and it always smelt of urine where someone had wet his bed. It was completely plain nothing on the walls and cold tiled floors. The only thing I could remember was how high the ceilings were and there was one light bulb for the whole room with no shade - every expense had been spared. "This moves me onto the bath house. This was a place of terror. There were four baths and three kids to a bath. The smell of carbolic would make your eyes water and you were scrubbed with a scrubbing brush the same sort your granny would scrub her floor with. They would tear at your skin but you never complained for if you did you would get a sharp slap across the face. Thankfully this was just once a week. "Family visits did not happen in my place as we were all long term with little or no hope of getting out. To this day I still don't know why I was put in the home and I don't think the others did either. But we never talk about it and you didn't make friends so you didn't talk much anyway but we all knew none of us had a mommy or daddy. "The matron of our building would give you a slap around the ear for just breathing the same air but there was one or two that were OK but this has to be the most loveless place I have ever encountered. "Spare time yes there was plenty of that, but that was because there was absolutely nothing to do or play with. There were two things I learnt from this place the first you never showed any sign of weakness if you did you were a lost cause, the second was to love my own children more than life itself and even though they are grown up we always have a hug every time we meet and always say I love you when we part. "I may sound bitter but far from it I was one of the lucky ones. The family that took me in that Christmas came back some months later and took me out for ever and I had the most wonderful Mom and Dad anyone could ever ask for I also had two wonderful sisters and a brother and the love I was given by them I will treasure until I die even though Mom and Dad are no longer with us or my little sister the three of us that remain are still just as close. They gave me a life. I always say I was born as a four year old before that my life was like death. "I suppose in reality had it not been for this place death might well have been the case so in some ways I am grateful." At Wolverhampton Archives & Local Studies, we hold all surviving records of the Wolverhampton Cottage Homes, covering the period from 1890, when they opened, to their closure in 1977. These records are strictly confidential for a period of 100 years. This means that, although customers would be able to view for themselves any records that are over 100 years old, for records made within the last hundred years they would have to apply in writing to the head of the Community Duty and Assessment team (currently Elaine Salter) for permission for us to conduct the research on their behalf. We would search the records on the customer’s behalf, under the terms of our postal research service, and provide him or her with a certified copy of any relevant information. The usual charge is £12.00 per half hour up to a maximum of £48.00 for two hours per enquiry, the price for 1 hour would be £24.00. If, having received permission, the customer decided to go ahead, he or she would visit the following website: www.wolverhampton.gov.uk/leisure_culture/libraries/archives/, scroll down to and click on the link to Postal Research Service, print off a postal research order form, fill it in and post it to Wolverhampton Archives & Local Studies at the address given on the form, along with a cheque (made payable to "Wolverhampton City Council") or credit-card details. Alternatively, the customer would simply write to us at the address below, including the name and any relevant details relating to the child or children to be researched, along with a cheque (as above) or credit-card details. "Although I am now in my late seventies and live half a world away, I can remember seeing groups of Cottage Homes boys walking along Cannock Road on their way to Springfield Road Senior (later Secondary Modern) School. This was in the 1940s. "They all wore the same outfit: dark blue beltless macs, made of heavy duty gabardine, that hid their short trousers, and boots that from the sound they made were reinforced with hobnails. Their heads were bare and their hair cropped very short – a sort of convict cut – [we thought it was] to stop the spread of head lice. "They had a reputation for being tough and my brother and I were advised to give them a wide berth. "At the time it was quite common for parents with naughty children, I was one, to be threatened them with being sent to the Cottage Homes, which to us sounded like a pleasant place." Do William's unhappy memories of Wednesfield Cottage Homes match with your own? Or do you remember better times? Please get in touch.